It's A Bonanza Every Month! There are FIVE ways to qualify for the $10,000 Bonanza running the first friday of every month. Your Chance to Hit the Gold Mine! On the first Sunday of every month we stage the $10,000 Monthly Bonanza tournament. 1. Make a First Deposit as a new Titan Poker player. 2. Generate 750 Titan Points. 3. Wager a total of $1,000 in casino bets. The $10,000 Monthly Bonanza tournament and all qualifiers can be found in the software under Special Offers -> $10,000 Monthly. Players will be eligible for the “10K Bonanza Depositors Sat” each week if they made a deposit during the Monday to Sunday period prior to the tournament date. Tournament tokens will be issued automatically after each satellite tournament and are non-refundable, non-transferable and cannot be converted to cash. Tokens received by players for the “10K Bonanza Depositors Sat” tournament, in a certain month will not be valid for a different month. 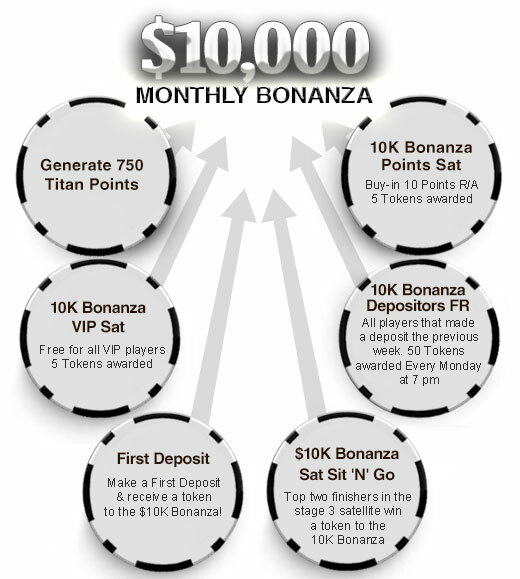 Players making their first deposit at Titan Poker will receive a token to the $10K Bonanza tournament running on the first Sunday of the following month. Players can win only one seat to the “$10,000 Monthly Bonanza” tournament in a given month. Extra tokens won are not valid for other months nor can they be exchanged. Players that qualified for this tournament by generating 750 Titan Points or wagering $1,000 in casino bets during the current month, will receive their tournament tokens on the day of the tournament. All Titan Poker casino games are relevant for this promotion. Tokens received by players for the $10K Bonanza Sat stage 2, and $10K Bonanza Sat stage 3 will not expire. A player may use up to four (4) $10K Bonanza tokens at the $10K Bonanza multi entry tournament. Players from the same IP address, or from the same household, are not eligible to participate in this promotion. A player found trying to enter with more than one account into a tournament will not be eligible for this promotion. The use of offensive language at the tournaments will disqualify a player from participating in this promotion. Any player found colluding during the course of a tournament will be disqualified and his account will be frozen. Any player found to be "soft playing" in order to allow another player to win during the course of a tournament will have his account frozen. Any withdrawals made on any winnings at the tournaments are subject to Titan Poker's standard withdrawal procedure and collusion check. Titan Poker has the right to stop its promotions, or change their conditions at any time. All decisions made by the Titan Poker management are final.